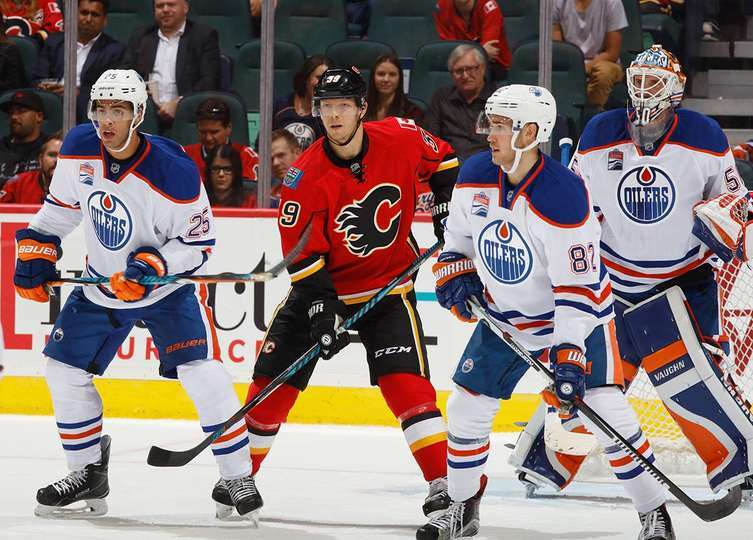 EDMONTON, AB - Patrick Maroon had a goal and two assists and Mark Letestu scored two markers as the Oilers went 3-for-12 on the power play to cruise to a 5-2 victory over the Calgary Flames at Rogers Place. Edmonton visits Winnipeg on Wednesday. Game time is 6:00 PM MDT and it can be seen on EdmontonOilers.com within the Oilers Region. Penalties were the theme of the night in Edmonton but not for the good guys. The Calgary Flames were called 12 times - five for slashing alone. 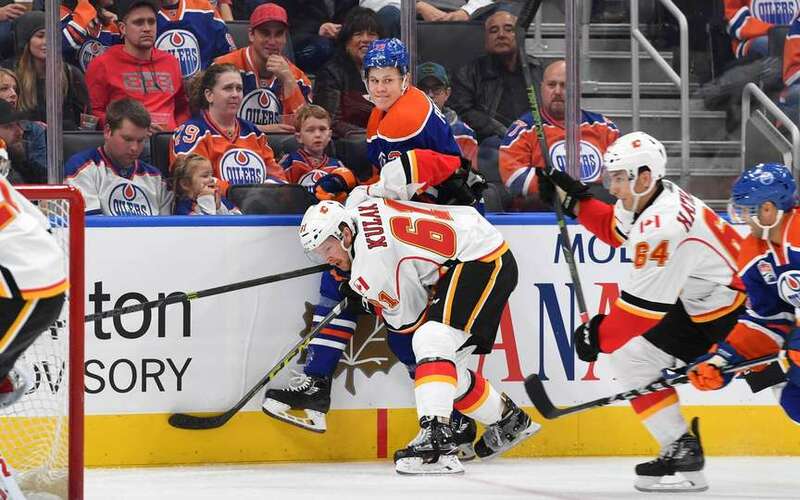 "You can see that there's going to be no tolerance for sticks that come off the ice and get up to the hand-hip area," Oilers Head Coach Todd McLellan said post-game. "We're trying to stress to our guys that there's no sense in going up there with your stick anyhow; nothing good can come out of it." Edmonton was called only twice for slashing minors. "Keep it down on the ice and check that way," said McLellan. Oilers Captain Connor McDavid compiled two assists, while the goaltenders - Cam Talbot and Eddie Pasquale - made 11 and 12 saves, respectively. Ryan Strome finished the night with two points as well - a goal and assist. "There's one or two I could have shot again," Strome, who had five shots on goal, said of his shoot-first mentality. "Just try to get the puck on net and hopefully good things keep happening." It didn't take long for the Oilers to muster offence in the split-squad match. With shots flying from the point on the behalf of pipeline defencemen Ethan Bear and Caleb Jones, the Oilers got on the board only 2:18 into the first period. Jones' wrister from the left point was deflected by Iiro Pakarinen before it got to the net but Letestu - who was idling on the doorstep - slammed the rebound past Flames netminder Eddie Lack to give the Oil an early 1-0 lead. Maroon would follow up the quick start with a power-play goal of his own just over three minutes later. As Flames forward Curtis Lazar sat in the box for slashing, Edmonton's first unit got to work. McDavid dished the puck to Maroon at the goal line. The rugged winger swept the puck towards the goal, then slapped at it again when it was loose, putting it through Lack's wickets. McDavid and Nurse registered the assists and at that point in the game, the Oilers were up 2-0 and leading the shot department 10-1. Ryan Nugent-Hopkins - playing alongside his good friend Joey Laleggia and Finnish winger Jesse Puljujarvi - then made it 3-0 on an unassisted marker at 14:50. Laleggia chased an Oilers dump-in, causing the puck to squirt loose behind the Flames' net. Nugent-Hopkins picked up the puck, took it to the side of the net and attempted to make a slot pass. His feed deflected off Calgary defender Michael Stone's stick and went far-side on Lack. Edmonton dominated the first period with their three-goal effort and owned the shot department 17-5. "I thought our whole group and them leading (Maroon-McDavid-Strome) were really good early," said McLellan. "We were on our toes, we were buzzing and then it kind of changed a little bit in the second period; we got casual and a little relaxed." In the second period, the Oilers continued driving much of the play but were not rewarded with goals like they were in the first. The Flames did begin generating some chances of their own, though, at times even while playing down a man. When Calgary did come knocking, Edmonton netminder Talbot kept the door shut. The keeper made two miraculous saves on Marek Hrivik in one instance. Down a man, Sam Bennett took the puck and drove it wide around the Oilers zone, forcing three Oilers on him. In doing so, Hrivik was able to find some open ice. Bennett fed Hrivik, who busted in all alone on Talbot, stickhandling from his right to left. With Talbot out of position, he extended his right pad and got his toe on the puck, as Hrivik knocked at it twice. Talbot was later replaced by Pasquale midway through the second. David Rittich replaced Lack. Near the end of the middle frame, Eric Gryba got called for slashing and the Flames nearly got on the board. Just seconds remained as Calgary pressed, with Stone eventually slipping home a tap-in marker on Pasquale just as the buzzer sounded. The puck crossed the line after the period ended though, securing the Oilers three-goal lead after 40 minutes. Letestu - the power play specialist - added his second goal of the game in the final period. While Emile Poirier sat in the sin bin for slashing, the Oilers top unit continued their offensive assault. Maroon threaded a pass from the left half wall over to Letestu on the right side. The veteran wasted no time unloading a slap shot that rifled the top right twine. Strome and Maroon registered the assists as the Oilers made it 4-0. "We've been waiting for this all summer," said Letestu. "We're ready to start right now." Strome added another power play marker in the third after he jammed in a rebound at the side of the net. Edmonton ended the night 3-for-12 on the man-advantage. "You're not going to get away with it during throughout the season if the standard stays where it's at," McLellan said of the special teams. "We'll be working on our special teams unit probably a little bit more because it will be required." In the final few minutes of play, Calgary finally got on the board. Matt Bartkowski scored a short side goal after a boarding penalty and Hunter Shinkaruk got another late one off a re-direction. That was all the offence Calgary would create, ending the game 5-2 Edmonton. The Oilers continue pre-season action Wednesday against the Winnipeg Jets on the road. Watch the game on Oilers TV starting at 6:00 PM MDT. Regional restrictions apply.